Spices are a difficult category to define. About the only common characteristic that gilds the group is that they are always plant material of some sort. Spices can be seeds, flowers, bark, roots, flower parts, leaves, resins, saps or other plant products. Spices have the historical connotation of exotic origins and it’s true of most. Historically, Asia, India, tropical islands and the Far East were the main sources of spice. Trade routes from the Far East through the Middle East and on to Europe were founded because of spices. Columbus set out for America because he was searching for a route to spice. Part of what made spices so expensive was rarity. Initially, however, spices were treasured more for their medicinal qualities. Get to know spices and then stretch your knowledge and build a variety in your kitchen. Start with these. Turmeric (curcumin). It’s the spice that gives Indian and southern Asian food that characteristic amber tint. More fragrant than tasteful, it’s an essential for curries. Medicinally, various components of turmeric have been found to be powerful anti-cancer agents, pain relievers (one study found curcumin equivalent to ibuprofen for pain relief of arthritis,) and more. National Institutes of Health has registered over 71 clinical trials completed or underway to study use of dietary curcumin for a variety of clinical disorders. Cloves are the dried flower bud of the clove plant. Pungent, sharp and powerfully aromatic, cloves enhance meals in fruit dishes, desserts and candied meats like hams. Anyone with a toothache while away from the dentist knows clove oil is a powerful pain reliever. It’s a proven antiseptic, too. Some people find lightly chewing on a whole clove a wonderful breath-freshener. Make a pomander with clove and an orange and you’ll have a natural, chemical-free air freshener that kills bacteria, too. Many spices can boost your health and should be a part of your “kitchen medicine cabinet.” Some applications (such as oils) can be very powerful. Getting advice from an appropriate healthcare professional is a good idea and going with the purest, organic forms of spice is best. Spices are often grown with the use of pesticides so avoiding those is preferable. When shopping for spices, check the stores that have bulk supplies. Whole Foods, No Name Nutrition and Next Millennium have quantities in bulk. Savings are substantial. Some of the ethnic markets like Namaste (114th & Dodge), Asian Market (north 76 Street), Jacobo’s (24th & “L”,) and Tulsi Indian Grocery (130 & Arbor,) have unique selections of packaged spices. All of the above stores offer product at prices far below the individually packaged small bottles of spices at the standard grocer. 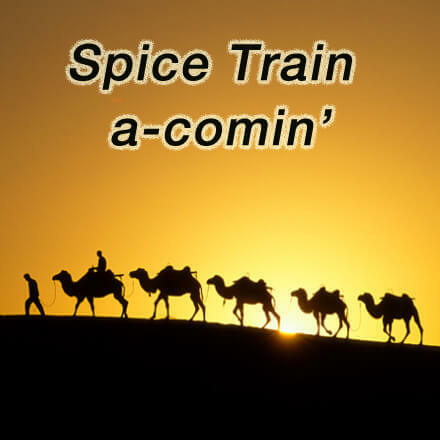 That way you can try the spice of life without hitching up your camel.